Dreams arise from the body and are a language of the body. 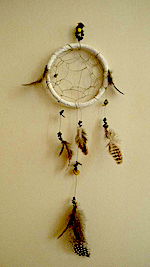 Dreams are a portal into our personal experiences of life. When we dream, we are communicating with ourselves in a language that is different than our waking language. Our dream images are a way we communicate to ourselves about how we are alive and how we are experiencing being alive. When we awaken we remember images and sequences of events. If we try to make sense of these images using our daytime mental processes, we can miss the experience of the dream itself. You may have already heard the notion that everybody in the dream is you. Instead of thinking about the person you dreamed about as a symbol with some specific meaning, you can learn to make a muscular shape of your dream figure. This brings the dream experience into your waking life and lets it teach you about what is forming in your life and what wants to form. Including dreamwork in your therapy will help us know you better and guide us in what you want to form in your life. When you use the somatic exercise to engage the dream experience you can deepen your self-contact and learn about how shapes influence experience. I will help you make a muscular shape that embodies your dream figure. Using voluntary muscular effort with this shape, you can experience your dream figure as a form or shape of yourself and work with it to grow new ways of being alive. The unconscious is what is unknown and our dreams, like our bodily life, are often unknown to us. The direct experience of your dream can provide you with options for engaging the unknown and forming your life.